KINGSTON – Australia maintained their dominance over the West Indies with a crushing 277-run victory on the fourth day of the second Test in Jamaica on Sunday to claim a 2-0 series win. They have not lost to the West Indies in 14 Tests dating back to 2003, winning 11 and drawing three and the gulf between the sides looked wider than ever as the hosts were bowled out for 114 in their second innings. Australia, who won the first test in Dominica by nine wickets last week, outplayed their hosts not just with bat and ball, but also in the field. West Indies were already in a hopeless position at the start of the day’s play and Australia ruthlessly wrapped up the win, taking eight wickets in 34 overs. Australia off-spinner Nathan Lyon completed the rout when he clean bowled Jerome Taylor for a golden duck. Steve Smith was named man of the match after making 199 in the first innings, while right-arm fast bowler Josh Hazlewood was voted man of the series. He took 12 wickets at an average of 8.83. Captain Michael Clarke had declared his side’s second innings late on Saturday to set West Indies a 392-run victory target with more than two days left. But his boldness paid off and he was full of praise for his bowlers. “What they’ve done really well is executed their skill over long periods of time, the whole attack,” Clarke said. The way Australia brushed past a West Indies side that drew a recent series with England will serve as a confidence booster ahead of the Ashes which starts in three weeks in Cardiff. West Indies resumed at 16 for two and lost five wickets in another feeble session for the addition of 56 runs before lunch. Shane Dowrich (4), Darren Bravo (11), Jermaine Blackwood (0), Shai Hope (16) and Jason Holder (1) all fell. Denesh Ramdin (29) offered some resistance after lunch but Kemar Roach and Taylor were out in quick succession. 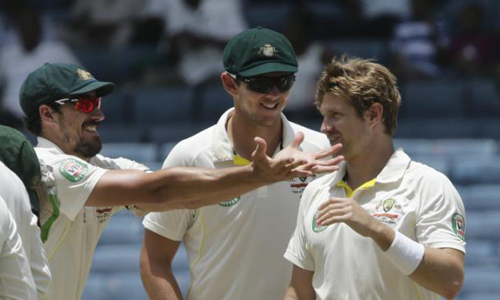 The Australian attack shared the spoils, with Mitchell Starc claiming three wickets, while fellow quicks Hazlewood and Mitchell Johnson, and Lyon, collected two each.